Summer Mountain | Cosa Mi Metto??? Are your holidays going well? Do you prefer the beach or the mountain? I've always been the kind of person that automatically connects the word "summer" to a deserted beach, but lately I'm rediscovering the charm of the mountains even with the hot weather. Breathtaking scenery, unspoilt nature, horizons to explore in company, you can relax in the sun, breathe fresh air, and let's face it, you can also enjoy lots of local delicacies. So for me the mountain is the perfect place to get a little bit of relax. The perfect outfit for a summer day in the mountains should be comfortable and practical, my uniform for these days consists of t-shirts, shorts, shoes and of course a jacket for the evening. And who said that even a sportier look like this can not be cool at the same time? Procedono bene le vostre vacanze? Siete amanti del mare o preferite la montagna? Io sono sempre stato il tipo di persona che alla parola "estate" collega automaticamente una spiaggia deserta, ma ultimamente sto riscoprendo il fascino della montagna anche nella stagione calda. Paesaggi mozzafiato, natura incontaminata, orizzonti da esplorare in compagnia, ci si rilassa al sole, si respira aria pulita, e si diciamocelo, si possono gustare anche tantissime prelibatezze locali. Insomma per me la montagna è il luogo perfetto per staccare un po' la spina. L'outfit perfetto per una giornata estiva in montagna deve essere comodo e pratico, la mia divisa per queste giornate si compone di t-shirt, pantaloncini, scarpe da ginnastica ovviamente e una giacca per la sera. E chi la detto che anche un look più sportivo come questo non può essere cool allo stesso tempo? Cool sneakers! I have to say I like both; the mountains and the beach! I love how you've styled this outfit! 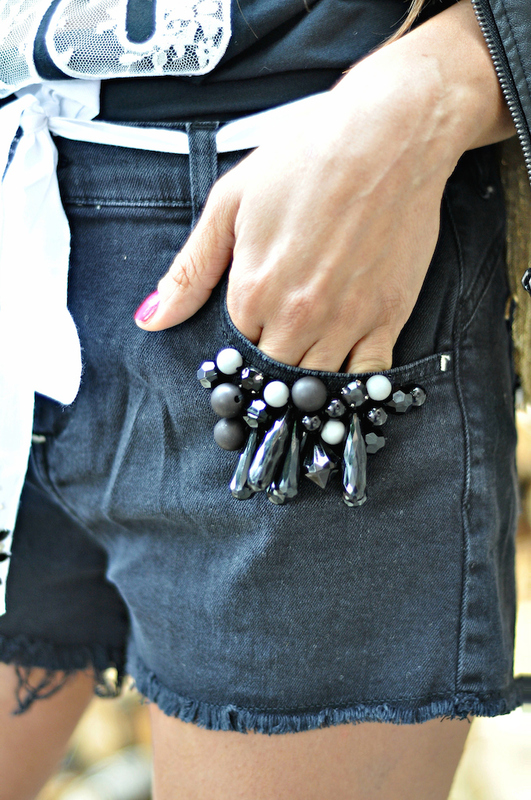 A little bit of rock chic with some sporty elements! Super cool! Very chic look! I am loving those sneakers! Very cute casual look. I love the sneaks and shorts! I usually don't like white bags but I love that one. Mountain person. Beaches just don't do it for me. Nor do bathing suits, but that's MY fault!